Hey everyone, just wanted to give everyone a little run down of how my day went yesterday and what the kids clubhouse casting call was like at the SNY studios. Well, first off, i woke up at 4 o clock in the morning (probably the only bad part of the day). Jumped on a train, and got into the city around 615. After arriving into the city, I proceeded to grab a quick snack and head to the SNY studios. Shortly after arriving at the studios, I realized there was virtually no one there, and that I had gotten up a little too early. However, I was the 7th person on line, so there are far more crazier people than I. I waited in the silence of the cold until a few SNY employees passed out some forms that I had to fill out; basically your typical, can we show you on tv?, what kind of experience do you have? and blah blah blah. I got all those filled out, then noticed a script sheet on the bottom of the pile of forms. 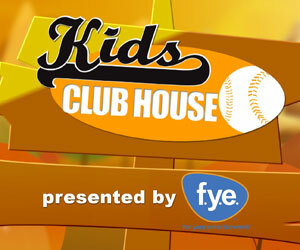 It read something along the lines of this ” Hi, I’m _______ and your watching kids clubhouse. Welcome back to kids clubhouse. Ever wonder how the grass stays so green at Citi Field? Well, we hung out with the grounds crew to see just what goes on to keep the field looking this great before every game. Come on!” (actually, thats exactly what the script read). I had to memorize that, and shortly after, Mr. Met comes running out with his own personal camera crew. Sure enough, the crowds cheering Lets Go Mets! in a matter of seconds. I waited in the blistering cold for about another hour until they finally let me in at around 915. I was the first of my group to go, so i walked right into the main studio where almost every SNY show is filmed. There sat Kevin Burkhardt, Chris Carlin and another woman who I wasn’t familiar with. They made me stand on a marker and read my memorized lines. I got it on the first try and Burkhardt proceeded with “Wow, he got it on the first try, nice job!” After that, came the interview. Numerous questions about my prior experience and my being a Met fan were asked, I handled each and everyone of them as if Grasso was asking me in Spanish class. They all seemed extremely impressed with my answers and they actually were having conversations with me. It was amazing.